I had a severe migraine since Friday and only got better this morning after I popped Naramig prescribed by my GP yesterday evening. Although still feeling groggy, I managed to whip a simple lunch of Fried Rice, Breaded Fish Bites and Baked Mid Joints. 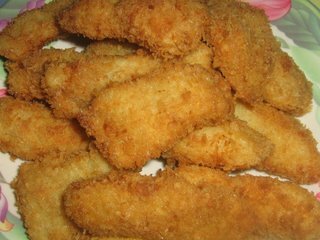 The recipe for the Fried Rice and Breaded Fish Bites can be found below. Heat oil and fry onion and ground chilli till fragrant. 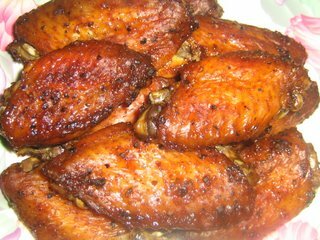 Put in sliced chilli, oyster sauce and chicken seasoning. 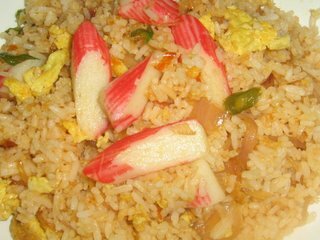 Fry in the eggs and crabstick. Then stir in the rice. Coat fillet bites with flour. Heat oil and fry fish bites for about 5 mins. I bought this pre marinated mid joint wings at the supermarket. Its really tasty and peppery hot!